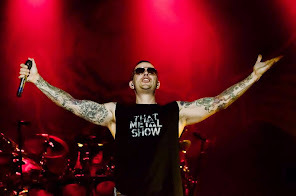 Avenged Sevenfold News: M.Shadows: "We will have some cool..."
M.Shadows: "We will have some cool..."
I just have a small suggestion for Matt or any other Band member lol. It would be So Amazing if you could put out a B-Side Album with the Soundtracks of this game. But only Non 8Bit though and with Lyrics MAYBE. So for example CD 1, could have the Non 8 Bit Soundtracks With Lyrics and CD 2 could have the Non 8Bit Instrumental Versions. Or Maybe a third CD with the 8 Bit Version. M.Shadows: This could be cool but we would rather leave it up to the Youtube community to turn these songs into metal versions. We will have some cool contest for this after the games release.